Surprise your mom or dad with a beautiful bunch of flowers. You don’t need to go to the flower shop or pick flowers from the garden. Just trace your hands, decorate and your flowers are done. It makes a great gift for someone you love. Tomi and Mimi were very happy to make flowers for their dad’s birthday. You can also make these flowers for Father’s Day, Mother’s Day, Grandparent’s Day and of course birthdays. When someone is feeling sick or when someone is leaving and you want to say bye, you can also give flowers. You’ll need only a few things. You probably have them at home already. Tomi and Mimi, first traced their hands on the paper with the pencil. Then they decorated it beautifully with their markers and cut them out. After that they painted a vase on the cardboard and cut it out. Tomi and Mimi then painted the vase almost full with blue markers, for the water. 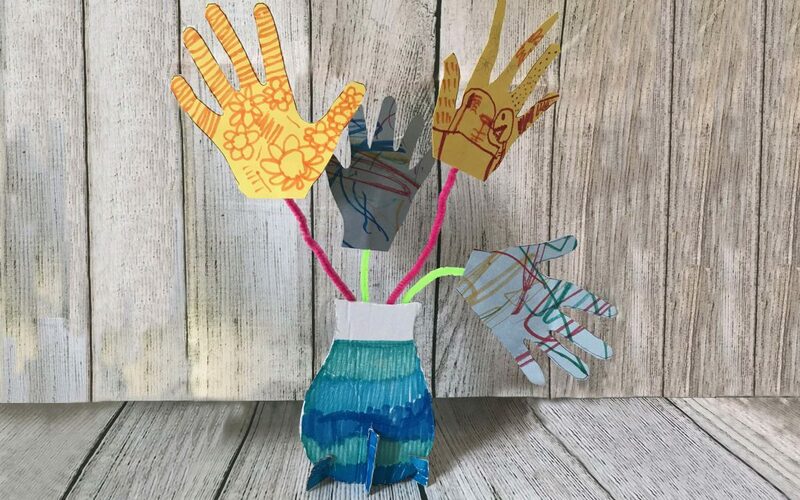 After that they taped pipe cleaners in their favorite colors behind the hands and the vase. For the last step, you may need a grown up to help you. Cut out a strip of cardboard and fold it in half. Cut two slits on each end of the cardboard strip. Start at the top and cut only half way. This way you can slide the vase in the slits so it can stand up. Tomi and Mimi had a lot of fun making this flower vase and hope you will enjoy it too! Who will you give it to? We hope you will make someone really happy with your beautiful flowers.